With today’s updates, the Azure preview portal supports the ability to view service health incidents that pertain to only your deployments in the Azure data centers rather than all services that Azure supports. 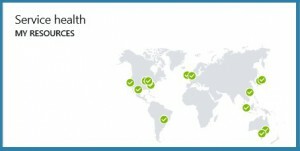 This is incredibly useful and significant because you don’t have to worry about getting service health data for all Azure services that don’t concern you. If there’s an outage or update incident associated with a given resource that you have deployed, you will be notified on the map. You can then drill from the map view into the event details view to get detailed information about the event and the progress that is being made towards resolution of that incident. These Azure health incidents can also be retrieved via our publicly available Event Service REST API Reference and the SDK in the Microsoft Azure Insights Library.